Dr. Gabe Bercz has owned and operated Paw Print Animal Hospital since 1992. His special interests are in orthopedic surgery and laparoscopic procedure. After completing an internship at Purdue University, Dr. Bercz completed a two year residency with a large practice in northern Indiana. It was at this time that he and his wife Andrea decided it was time to return to Cincinnati and open a practice in their hometown. During his career, Dr. Bercz has served as president of the Cincinnati Veterinary Medical Association, president of the Greater Clermont County Veterinary Medical Association, has served on many boards, and is a member of the American Veterinary Medical Association. He lives in Anderson Township with his wife Andrea and three children. In his free time he enjoys running, fishing, and most of all, spending time with his family. 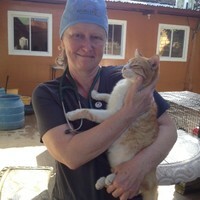 Dr. Jane Goecke is an accomplished veterinarian who has been with Paw Print Animal Hospital for over fifteen years. She is a retired professor from the University of Cincinnati School of Veterinary Technology. She lives with her family and pets in New Richmond, Ohio.